Reframed Stories asks people to respond to dominant themes in news coverage about themselves and the issues that affect them. The stories center on the reflections of persons who are more often represented by others than by themselves in media. This graphic tells me that our media does not take indigenous youth into account, and we have the right to make our opinions heard. We want to do many things for our communities and we have lots of ideas. We also want to keep learning more and getting involved in different topics that resonate with us, but when I look at this graphic I see that mainstream media might not have any space for us: the word “youth” does not even appear here. 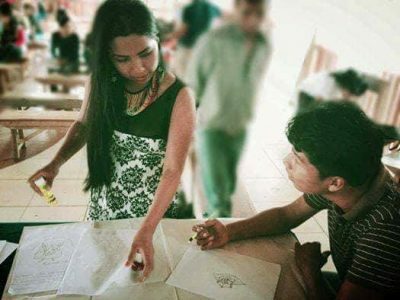 In this cloud of dominant words associated with “indígena” in Ecuadorian news coverage between January 2016 and January 2017, terms related to “youth” (jóvenes) did not appear. Source: Media Cloud (View larger image). We need more outlets where youth can get involved and make our voices heard because we, too, have much to say and offer. We need to find new ways to empower youth to get involved in the initiatives initiated by our elders and other leaders from our community, so that we can continue with their legacy and we can keep strengthening the work that has been done so far. If not, young people could feel excluded from the collective battles that are taking place at the moment, and all the work that has been done could be lost as time passes by. We must prevent this from happening by finding avenues to bridge generations closer together, so that people of all ages can collaborate in the topics that are important for our communities, and in the issues that affect us all. Youth workshop in Sarayaku. Photo provided by Abigail Gualinga. This is part of a Rising Frames series developed in close collaboration with the indigenous community of Sarayaku and the Shuar nationality, both situated in the Ecuadorian Amazon region. 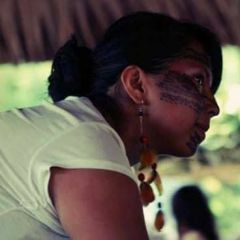 The Sarayaku and Shuar people have battled at national and international levels to stop extraction projects in their territories, and public messaging has been an important part of this struggle. We asked members to respond to media analysis that suggests how topics related to their communities are represented in news. This post was proofread by Belen Febres-Cordero.